Anna senior Griffin Doseck, right, drives to the basket with pressure from Russia’s Daniel Kearns during a Shelby County Athletic League game on Tuesday in Anna. Doseck scored 10 points while Kearns scored 14 points. Anna junior guard Bart Bixler defends Russia's Mason Dapore during a Shelby County Athletic League game on Tuesday in Anna. Anna's Isaac Lininger, right, drives to the basket ahead of Russia's Carter Francis during a Shelby County Athletic League game on Tuesday in Anna. Anna's Justin Murray shoots with pressure from Russia defenders during a Shelby County Athletic League game on Tuesday in Anna. 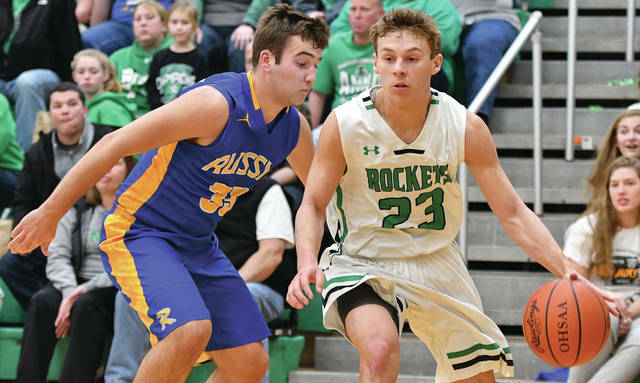 Anna junior guard Bart Bixler dribbles with pressure from Russia’s Carter Francis during a Shelby County Athletic League game on Tuesday in Anna. Bixler led Anna with 19 points. Anna withheld a late rally attempt by the Raiders and earned a 58-52 victory to improve to 13-0 overall and 8-0 in SCAL play. The Rockets have a two-game lead in SCAL standings over Jackson Center (10-3, 6-2), which was idle on Tuesday. 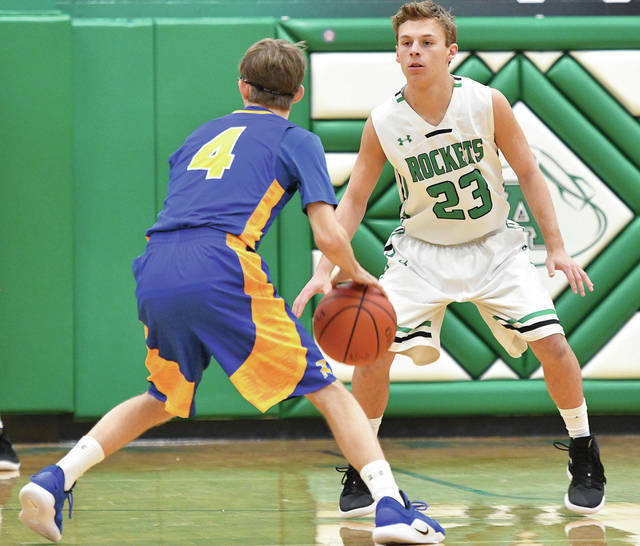 Outside of a 59-51 win over Fort Loramie on Dec. 28 and a 68-67 win over Marion Local on Jan. 5, the rest of the team’s victories have come by double-digit margins. Anna is averaging over 74 points per game and is allowing an average of 50. Russia made the Rockets work for it on Tuesday, though, partly thanks to a strong inside game. Russia outrebounded Anna 40-20, including 18-6 on the offensive end. 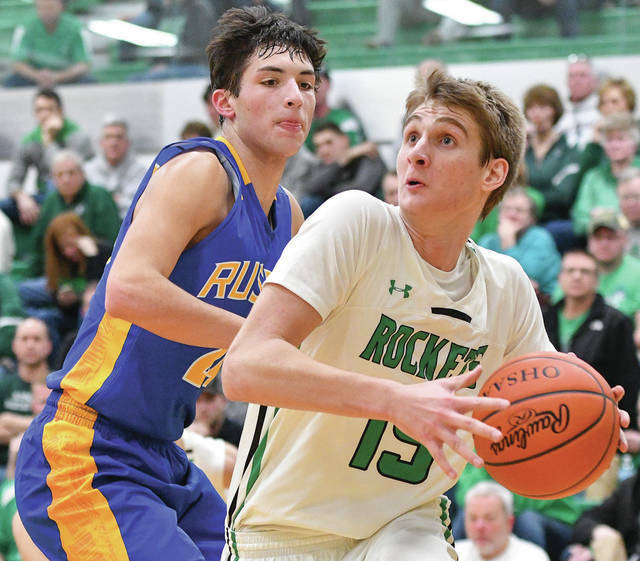 The Rockets’ typical defensive pressure and ability to score points off turnovers helped earn the victory, in addition to hitting six 3-pointers and good late free-throw shooting. Senior guard Bart Bixler led Anna with 19 points, including making 6-of-6 foul shots in the fourth quarter. Riley Huelskamp scored 14 points and Griffin Doseck and Carter Elliott each scored 10. Doseck, who is 6-foot-4, bared the brunt of being guard by Russia 6-5 senior forward Daniel Kearns. 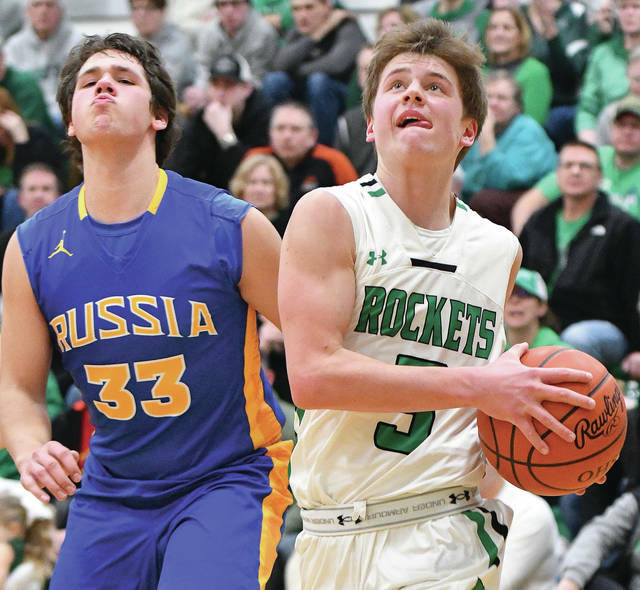 The Rockets had a 10-point lead going into the fourth quarter, but a basket by Jordan York and a free throw by Evan Monnier brought Russia within 56-52 with 30 seconds left. Russia had two missed shot opportunities on its last possession when the gap was at four and also nearly grabbed control of a loose ball in the final minute that could have resulted in an extra possession. Anna got a rebound after Russia’s misses, and Bixler made two foul shots with two seconds left to seal the win. The loss drops the Raiders to 8-5 overall and 4-4 in league play. It erases the last remaining hopes of contending for a league title, which the program had captured at least a share of for the last five years. It was the third loss in the last four games for Russia. Kearns led the Raiders with 14 points while Adam Dapore scored 10. Evan Monnier and York each scored nine. Russia finished the second quarter on a 10-4 run to pull within 24-20 at halftime, but Anna extended its lead back out to double digits in the third quarter. 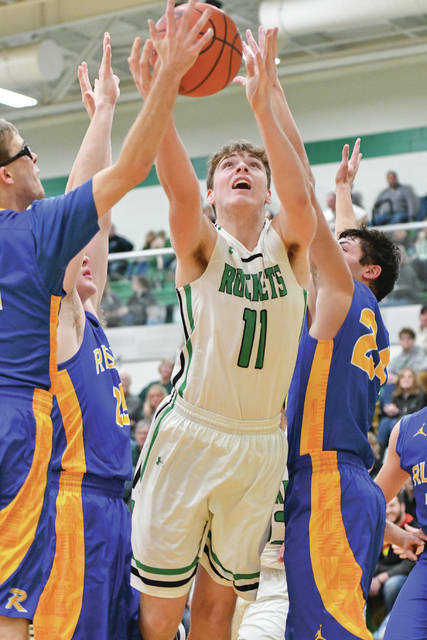 Kearns scored the first basket of the third quarter to pull Russia within two points but the Rockets then went on a 12-6 run to take a 36-28 lead. Monnier made a basket with 1:55 left to cut the gap to 38-33, but Kam Steward scored five points on two long baskets over the next minute to help extend the lead to 43-35. Huelskamp ended the third quarter with a steal and a layup to boost Anna’s lead to 45-35, but the Raiders battled back in the fourth. The Rockets scored the first five points of the game and finished the first quarter on a big run to take control. After Dapore made a basket with 2:15 left to pull Russia within 11-8, Elliott made a jumper, Bixler made a layup after a steal and followed with another bucket off the glass before the end of the quarter to boost the lead to 17-8. Huelskamp hit a 3 from the right wing to open the second quarter, which pushed Anna’s lead to 20-8. The Raiders pulled back it in, though, by switching to a zone defense that caused problems for Anna getting the ball inside. On the offensive end, Kearns made consecutive baskets and Michael York made a shot off the glass to pull Russia within 22-20 with 52 seconds left. Doseck made a basket before the end of the quarter to extend Anna’s lead to four points. The Rockets will play at Houston on Friday. Russia will continue SCAL play on Friday at home against Botkins. Anna junior guard Bart Bixler defends Russia’s Mason Dapore during a Shelby County Athletic League game on Tuesday in Anna. Anna’s Isaac Lininger, right, drives to the basket ahead of Russia’s Carter Francis during a Shelby County Athletic League game on Tuesday in Anna. Anna’s Justin Murray shoots with pressure from Russia defenders during a Shelby County Athletic League game on Tuesday in Anna. This entry was tagged Anna, Bart Bixler, basketball, boys, boys basketball, Daniel Kearns, Dave Borchers, Griffin Doseck, high school, Jordan York, Nate Barhorst, Nathan Barhorst, Raiders, Riley Huelskamp, Rockets, Russia, SCAL, SCL, Shelby County Athletic League, Shelby County League. Bookmark the permalink.